Was I cursed? Why did I get these genes? I, like many people, just saw myself as a collection of genetic misfortune. I played sports, could run fast, and yet I was still fat. My diet was relatively good by American standards, so why was I overweight? The problem, I see clearly now, was not my genes; they're serving me well enough today. The problem was my lifestyle. The meat, eggs, dairy, processed food, caffeine, and sedentary behavior was what was causing my problems. All I needed to do was to bring myself in line with nature's laws so raw food health could be mine. Since age 17, I've gradually ratcheted up my health. I first cut out junk food, greatly increased the amount of fruits and vegetables I was eating, and started a regular intense exercise routine. With only this my 5'11 frame dropped from 220 pounds to around 190. I started to feel better, my headaches diminished, but there was still a backbone of disease in my life. There was blood and pus in my stool, and I was frequently constipated. I still had periodic headaches, my energy levels were not that great, and I still got sick two or three times a year. By my sophomore year in college I had spent almost two years reading up on the health benefits of a vegan diet. Books like Professor Colin Campbell's "The China Study," made it clear that animal protein is a major cause for most of the western diseases of affluence that affect us, namely cancer, heart disease, obesity and type two diabetes. That year I made the plunge and cut out meat, dairy, and eggs and took up running daily. I dropped another 10 pounds and started to feel more energy than I had before. I was now only rarely sick, but my intestinal problems, which I'd eventually find out were stemming from colitis, actually got worse, probably because I had replaced many of the animal protein calories in my diet with grains, which are high in gluten and problematic for the body. I consulted with a number of cooked food vegan doctors, but none could offer me a solution that worked. Finally, I ran across a little pamplet called "Grain Damage," by Dr. Douglas Graham, who went on to publish The 80/10/10 Diet. I suddenly had my answers: Cut out the cooked food and the unhealthy starches, treat my body to delicious fruits and vegetables, and all will be well. Dr. Graham was right. Adopting a healthy raw food diet cured my intestinal/Colitis problems within months, gave me more energy than I had ever experienced, and I haven't been ill since I adopted the diet. Today I'm a trim 159 pounds, 61 pounds lighter than my all time high. My running stamina has easily doubled, my mind is clearer than it ever has been, and I just feel great. I have raw food health. As a newspaper reporter, I'm used to writing articles that inform, and I thought that maybe I should try providing information for people interested in curing disease and finding health online. I hope to be that person that walks into your life and gives you a refreshing slap across the face, the same one that I was looking for all those years ago. Learn how you can find raw food health. 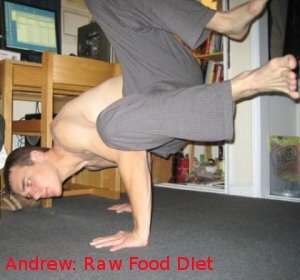 Adopt a healthy raw lifestyle.